This week we'll discuss some differences between a site finished hardwood floor and a pre-finished hardwood floor. In general we will be talking about solid 3/4" thick hardwood flooring. This can be of any species because the finish will generally be the same whether it's an oak floor or maple floor or any other species of hardwood. 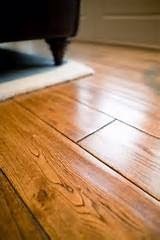 Pre-finished hardwood flooring in most cases (not all) will have aluminum oxide injected into the finish. Why is that important? Well, aluminum oxide is the second hardest mineral. Only diamonds are harder than aluminum oxide. Putting aluminum oxide into the finish on a hard wood floor will make the finish extremely hard. It's so hard that it is also hard to sand down and refinish the hardwood floor at a later date! Now, ideally, with these new floors with aluminum oxide in the finish, you will not want to sand them down and refinish in the future. If your finish starts to look scratched and worn down (which will be a lot harder to do with these new wood floors) you will want to screen the top layer and apply a new finish. Sanding down through the finish won't be necessary in most cases if you catch it before you have wear through. Aluminum Oxide is what they use in sand paper! Aluminum oxide is added to the urethane in the finishing process and then the wood floors are UV cured. There is no harder finish out there at this time. Site finished hardwood is the process of sanding down an unfinished hardwood floor, then applying a sealer and a couple coats (or more) of urethane. The urethane is what constitutes the wear layer on a wood floor. This process is the only way to spruce up an existing floor but not near the best way for a new hardwood floor. You don't have aluminum oxide infused into the urethane wear layer and it's not UV cured. You can use some of the best site finishes out there (such as Mega Traffic) but it still will fall far short of the hardness and wearability of a prefinished hardwood floor. So, when buying a new hardwood floor, the best way to go is to buy and install a pre-finished hardwood floor that has aluminum oxide in the finish. We finish up our discussion on best carpet yarns this week with this blog on solution dyed nylon. The solution dying process is mainly used in commercial grade carpet. You don't see this process used very often in the manufacture of residential carpet but one of the big three carpet mills, Beaulieu, has a new line of carpet using this dying process. Simply put, solution dying is the process of injecting the dye into the carpet yarn while it is still in liquid (solution) form. When the yarn is extruded the color (dye) is all the way through the yarn. Most carpets are made with greige goods and then dyed to a specific color. In this process the carpet is made with greyish/white colored yarn and then run through a dyer where the yarn is dyed. If you were to cut a carpet yarn in half that is dyed in the conventional method, the inside of the yarn would still be the greyish/white color. If you were to cut a solution dyed nylon carpet yarn in half, you would see that the yarn is colored completely through. Inside and out. Because of the way solution dyed yarn is dyed, it is very stain resistant, extremely fade resistant and still wears like a nylon yarn (because it is a nylon yarn). So you get all of the benefits of nylon yarn (wear resistance, resiliency and softness) along with the fantastic stain resistance that you would normally see in olefin yarns or polyester carpet yarns. Some of the best warranties in the business are attached to this style of carpet (and I mean actual warranties, unlike some of the warranties that mills put on their carpets that have so many restrictions and limits that they will almost never pay off on any of their warranties!!). You can even clean some of the toughest stains using a mixture of half water and half bleach! Try that with any other type of carpet yarn and see what happens........large whiteish blotches will form on your carpet if you were to try this cleaning solution with just about any other type of carpet.